Regenerate the mind and body with spa treatments and massages at our Spa Cinq Mondes. Our luxurious spa provides you with a new world experience called a Sensorial Journey. Inspired by ancestral ritual massages practised in Bali, India, Brazil, Japan, and Polynesia, these treatments create a state of balance inside and out. The spa is open from 11am to 8pm from Monday to Friday, from 10am to 8pm on Saturday and from 10am to 7pm on Sunday. 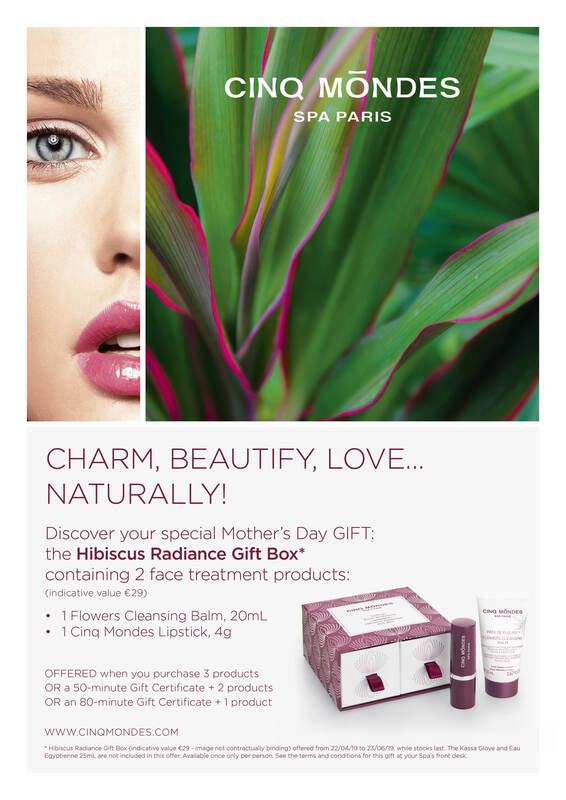 Don’t forget to spoil your mom with our special mother’s day present, the Hibiscus Radiance Gift Box! Exceptional Indian treatment in 3 stages for in-depth replenishing, the Shirodhara holds a unique place in Ayurveda well-being and relaxation treatment, Indian ancestral medicine meaning science of life. To begin the ritual, the warmth of the Hammam combined with the benefits of Aromachology® and the essential oils prepare the body and mind. Drawing inspiration from a thousand-year old Indian Ayurvedic tradition, this warm oil massage is a truly relaxing experience for the whole body, releasing tension and fatigue, awakening the body to a new sensoriality. Travel to the heart of Indian tradition and discover the exceptional treatment of the Maharajahs. Enjoy a relaxing time for body and mind due to the healing properties of warm sesame oil skillfully rubbed on your forehead. The benefits continue with a marvelous scalp massage, allowing you to unwind and let go with rare intensity. The Royal ritual Shirodhara® is available for €335 per person. It can be provided in a double VIP room. Your well-deserved break from the usual, awaits you at Cinq Mondes Spa. Indulge in a 50 min., 1h50 Spa Ritual or entire day of wonderful catered care. With an extensive menu of treatments and massages, our Day Spa Packages and Offers allow you to experience them all. From body rituals to hands and feet treatments, your wellness will be in experienced hands. Enjoy the serenity of the Sonian Forest while cleansing your body of stress and toxins at Spa Cinq Mondes. We invite you on a journey of discovery where you'll experience treatments and massage techniques from around the world.